A back blessed with sublime balance and blistering pace, Luke Fitzgerald is considered one of the most exciting broken-field runners in world rugby. The son of former Ireland international prop Des, Fitzgerald was tipped for great things as a youngster, with his scintillating performances for Blackrock College at schoolboy level earning him comparisons with Brian O'Driscoll. 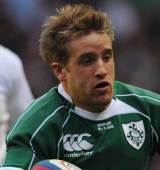 Within a couple of months of completing his second-level education, Fitzgerald was playing in the same side as the legendary Irish centre, making his debut for the province in September 2006. So great was the impression he made in his first few outings for Leinster that he was handed his Ireland debut that November, against the Pacific Islanders. His second cap did not arrive until the following summer, against Argentina, but 2008 was to be Fitzgerald's break-out year, with the versatile back, who can play at centre, wing or fullback, being granted starts against Canada, New Zealand and Argentina. By 2009, he was a regular in the Ireland starting XV and he started every game during the side's Six Nations Grand Slam success, notching two tries in the win over Italy. His fine form for province and country earned him inclusion in the British & Irish Lions squad for the summer tour of South Africa. Fitzgerald performed admirably for Ian McGeechan's side but he will be best remembered for being the victim of an eye gouge from Springbok flanker Schalk Burger. Things would get worse for Fitzgerald later in the year when he suffered a serious knee ligament injury in Ireland's draw with Australia. However, he made a successful return from injury in September 2010 and has been included in the Ireland squad for the autumn internationals.